In THE Immortal, you're a young wizard on a quest to find your mentor, who has disappeared suddenly. The best, and incidentally most lethal, place to look for him is the labyrinth, where many men have entered but few have emerged. In the world of THE Immortal, nobody is safe. Engage in real-time combat as you fight to save your life, so that you may save your teacher, mentor, and most of all, friend. You're sure to die at least a few times (the designers created more than 30 death animations), so learn from the past and try not to make the same mistake twice. The controls were very responsive. This game had tons of items and weapons, for you to pick up and use. 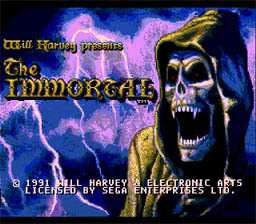 The Immortal was probably the most difficult game I've ever played. You will need to pick up items and weapons to survive and some of the things enemies drop can be very valuable and maybe even powerful.